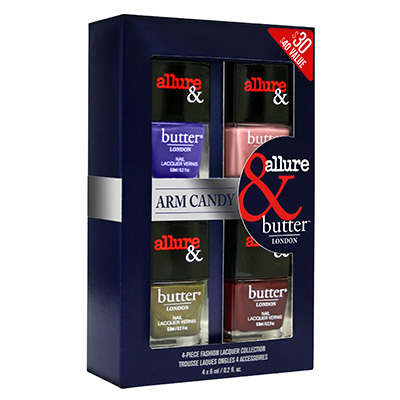 For most of us beauty lovers - Allure Magazine is the monthly read we MUST have. 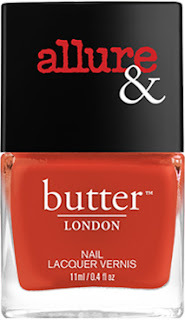 So if you combine magazine staff's beauty editor's wealth of knowledge about nail polish and color trends with the fashion forward nail polish brand Butter London - what do you get? Two more shades I love from the collection (shown, left). Statement Piece, which is the perfect Orange Red, that looks equally amazing on fingers as it does toes. 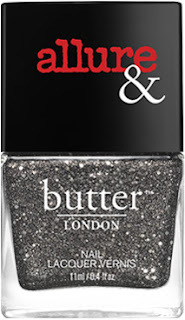 And for a dramatic, cool-yet edgy shade, I also love Disco Nap, which is a Charcoal Grey with medium/fine silver glitter (this one has a grainy texture not a smooth, opaque finish). There are also very pretty pastels, rusts and neutrals in the collection that will transition perfectly into Fall. *These products were provided courtesy of /Butter London PR for reviewing purposes.